Recently released real estate data show rising home prices and a drop in the number of homes sold in La Plata County during the second quarter of 2018. The 416 Fire could prompt a slight dip in real estate sales, but overall, the market is expected to remain strong. Second quarter real estate data reflecting sales from April to June didn’t show lower sales. But it is possible that sales in July through September could be down slightly, Wells Group real estate agent Rick Lorenz said. If the market follows the same trend Durango experienced after the Missionary Ridge Fire in 2002, a drop in sales won’t last, he said. “The fact we haven’t had a single building burn, not even a storage shed, has been to our advantage,” he said. A slowdown is possible, in part, because some home buyers couldn’t get home insurance during the fire, he said. Second quarter numbers show home prices continue to rise in La Plata County, Durango and Bayfield. At the same time, fewer homes sold in the second quarter compared with the same period last year, reflecting a need for new homes, real estate agents said. The La Plata County median home price rose to $385,000, up from $362,000 in the same quarter in 2017, according to the Durango Area Association of Realtors. The total number of homes sold in the county was down 4.5 percent from 537 to 513 for the same period. In Durango, the median home price rose to $520,000 compared with $435,000 during the same period last year. The total number of homes sold in town fell from 95 in the second quarter of 2017 to 78 in same period in 2018. In the first quarter of the year, the median home price was $548,950 in Durango compared with $415,000 during the first three months of 2017. The number of homes sold in the first quarter in town also fell slightly, from 33 in 2017 to 30 in 2018. In Bayfield, the median home price for the quarter rose to $324,500, up from $296,200 for the same period last year, and the total number of homes sold during the second quarter fell from 30 to 20. Construction in Three Springs, Twin Buttes, Bayfield and county subdivisions, such as Edgemont, is expected to help meet demand, said Wells Group Realtor Max Hutcheson. Edgemont Meadows, northeast of Durango, put more than 80 lots on the market in spring of 2017, and more than 40 of them are sold or under contract now, Wells Group Realtor Justin Osborn said. He expects the new homes in Edgemont Meadows will be priced in the $500,000 to $700,000 range. 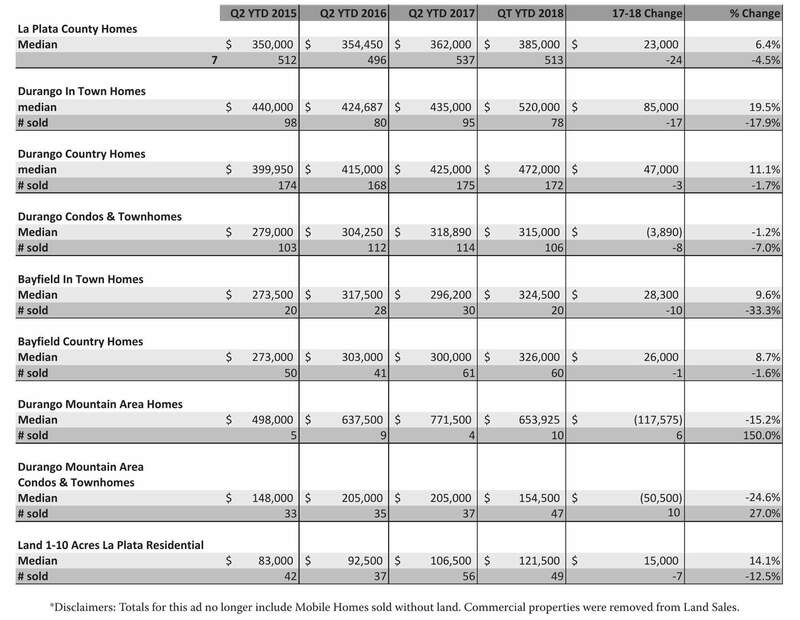 This table shows quarter-to-quarter real estate data for La Plata County, as of the second quarter of 2018. Builders are buying many lots in Edgemont Meadows for homes that will be put on the market when completed, she said. New home construction is also underway in Spring Creek Village off Florida Road, Estancia in the Animas Valley, and Mountain Trace on East Animas Road (County Road 250), all of which will help meet demand, Hutcheson said. 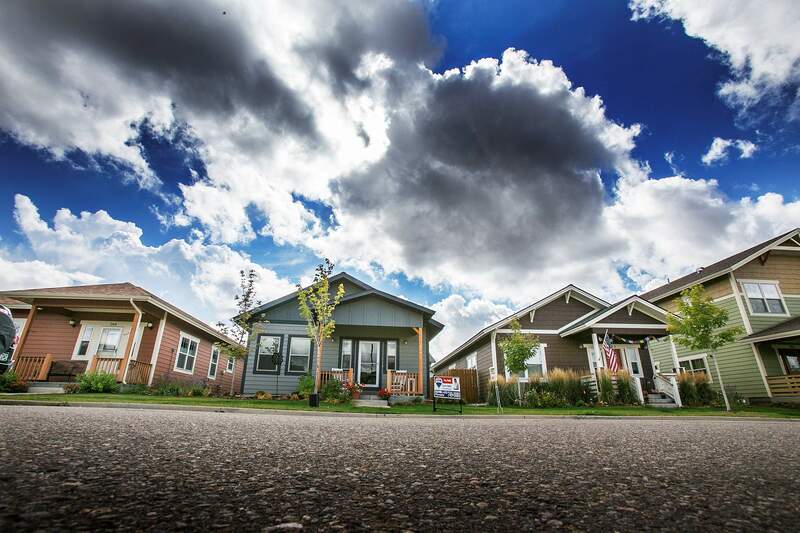 In Three Springs, a rapidly growing area, 23 homes are for sale between $329,000 and $399,000, said Gary Whalen, vice president of sales and marketing with the Growth Fund’s Real Estate Group. An additional 100 lots either are for sale or soon to be for sale in the subdivision, he said. Whalen said he expects 40 of those lots will be developed into homes that could be sold for less than $400,000. In Bayfield, the seventh phase of Clover Meadows is expected to add 50 new lots to the subdivision near Bayfield Elementary School, said Isaac Fleener, owner of Bayfield Realty. But it may be a while before construction starts because it is still in the town’s approval process. Currently, four houses in Bayfield are listed for less than $300,000, and the tight market is leading more people to look for homes outside town limits, he said. In general, real estate agents were optimistic about the long-term outlook. The percentage of cash sales across La Plata County, in particular, shows buyer confidence, Lorenz said. From January through June, about a quarter of the residential sales in La Plata County were cash, according to data complied by Lorenz. “Where are they putting their smart money? They are putting it in real estate,” he said of buyers. mshinn@ durangoherald.comThis story has been updated to correct the amount of time the land in Edgemont Meadows has been on the market.